Powerful yet affordable robot platform designed for the serious hobbyist or the budget-bound teacher. ARobot is a completely programmable mobile robot with an onboard processor, whisker sensors, LEDs, speaker and buttons for user input. Programming is performed by connecting ARobot to your PC and writting programs in the easy-to-understand PBasic language. Programs are executed on ARobot with the Basic Stamp II microcontroller from Parallax. 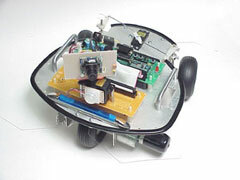 ARobot sports an all-metal chassis, a real DC gearmotor with optical encoder, and rear-wheel steering. 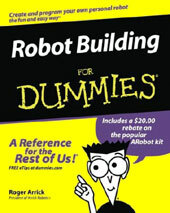 Expansion is easy using the on-line project files or with the 'Robot building for Dummies' book. 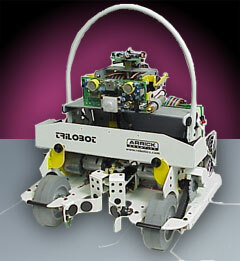 Trilobot is a full-featured platform for the serious robot enthusiast or research project. Trilobot utilizes 3 processors for distributed control of motor and sensor control. All-metal construction with pan-tilt head, gripper, differential drive motors and sensors galore. High-level programming is performed by a user-supplied processor that communicates with the Trilobot via a serial connection - either tethered, on-board, or wireless. Sensors include sonar range finder, 4-directional light level, temperature, 8 whiskers, Passive infrared motion detector and a 2-degree digital compass. Trilobot has been featured on TV and on the front page of Scientific American's website and has been used by numerous research teams around the world with published papers.